Earlier this week I spotted a recipe for Creamy Roast Chicken and Rice Soup at Fuss Free Cooking that sounded really good. I LOVE creamy soups, but rarely make them because they can be a bit heavy and sometimes lose a little in the non-dairy translation. This recipe, however, was ALREADY non-dairy and did not require any substitutes. The trick here is genius – instead of adding cream or non-dairy cream, cook rice until it is mushy and then puree it to make a creamy base. I loved the idea, but have to admit, that I doubted that it would work OR taste good. I WAS WRONG. I modified the recipe from the original to make a stock, added the meat that was used in the process, threw in some vegetables, and finished the soup in the crockpot. As far as crockpot recipes go, this is a speedy one, which makes it perfect for those days when you have a little time but not the entire day for your meal to cook on the countertop. This soup is very tasty, and as an added bonus, SUPER low in calories. 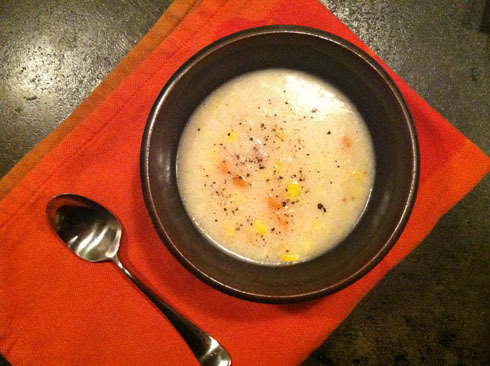 This recipe makes approximately 9 c. of soup, and each serving is only 157 calories. Compare that to a regular cream of chicken soup which comes in around 240 cal for the same amount, and what you have is not only a tasty meal but a calorie saving jackpot. This recipe was popular at our house, and I’d highly recommend it. In a large pot, heat olive oil over medium high heat. Add chicken and cook on each side for 3-4 minutes, or until browned. Add carrots, celery, and onion and stir, then cook for 2-3 minutes. Add water and bring to a boil. Reduce heat to low and cook for 1 hour. Remove chicken and set aside to cool slightly. Strain stock and discard solids. When chicken has cooled, remove meat and chop into bite sized bits, discard skin and bones. Add stock and uncooked rice to a crockpot. Cook on low for one hour. When rice is cooked, puree with a hand blender. Add reserved chicken, carrots, and corn. Cook for at least one hour on low, adding water if it gets too thick. Next week, when you’re so sick of turkey and turkey related goods, this is the meal to make. It is easy, delicious, and light, all of which will be totally welcome. 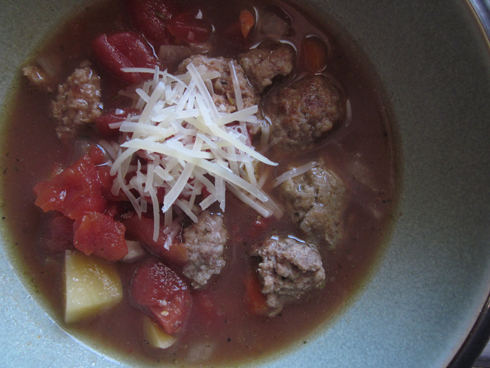 Making this soup is super easy and most of the cooking is done in the crock pot. Dice up a few things, open a can, toss in the rest and let it cook for 6-8 hours if you can wait that long. It is hard, because this recipe will make your house smell like heaven (if heaven smells like Italy, which some might argue would be just). Before you get started, there is one thing about this recipe that is very different from those that I usually make. Most of the time, I am fully in favor of substituting ingredients based on what is on hand. This recipe is the exception – there is one ingredient that you CANNOT DO WITHOUT. Penzey’s Sandwich Sprinkle. Never heard of it? Neither had I, until this summer when I was at a Penzey’s store with my cousins Julia and Jenine. They told me about how much they loved the Sandwich Sprinkle. “It makes any sandwich awesome,” they said. “You can put it on anything and the kids will eat it,” they told me. They are trustworthy gals, so I picked one up. To be very honest, I expected to like it fine but thought it was unlikely to be THAT remarkable. And seriously, not only were they right, but I do not think that they did it justice. I put it on sandwiches, use it to make croutons, mix it with cream cheese for my bagel, add it to soup, you could even SHAKE IT ON YOUR TONGUE AND BE HAPPY. It is that delicious, and you should order one today. Get a good-sized one, you won’t be sorry. Add all ingredients to a crock pot and cook on low for 6-8 hours. 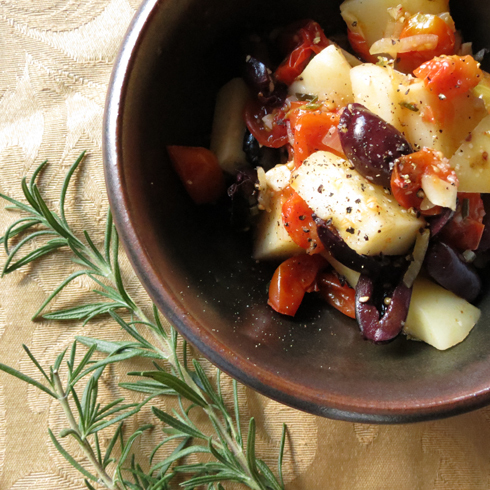 – I used Penzey’s Tuscan Sunset herb blend, but if you don’t have that, you could try another Italian herb blend. It is pretty good though, so if you’re ordering some Sandwich Sprinkle anyway you might want to give it a try. – For the meatball recipe, I used a modified version of the kind made at Buca (this recipe, but without the romano cheese and panko instead of the Italian breadcrumbs). However, you could use any recipe you like, frozen meatballs, seasoned or plain. Just make sure they are cooked before you throw them into the pot.